A writer is subjected to one of the most painful experiences known to man, and lives to tell about it. In 1983, the entomologist Justin Schmidt published the results of a uniquely unenviable project: He had created a scale that attempted to quantify the pain inflicted by various forms of insect bites and stings. Some stings cause no pain in humans, thus meriting a 0 on Schmidt's scale; insects such as bees and wasps -- which inflict a wound that is definitely painful, but not excruciating -- warrant a 2 on the scale. A 4 was reserved for bites that are, indeed, excruciating. The unenviable part was this: To create his scale, Schmidt used himself as a guinea pig. He let himself get bitten by various insects, and then recorded the results. Rather poetically, in some cases: Wasp stings (2.0 on the scale) are "hot and smoky, almost irreverent"; the bite of a red harvester ant (3.0) is "bold and unrelenting"; that of a tarantula hawk (4.0) is "blinding, fierce, shockingly electric." Schmidt's work was an attempt to bring description to the almost indescribable pain that some insects can inflict on their human victims. Now, a story in the New York Times both adds to that project and flips it around. It's a story that is all about the subjectivity: a history told by the victim. Jackson Landers, who is a hunter and activist as well as a writer -- and a guy who has had crossings with bears, lionfish, and other contextually terrifying creatures -- was, this spring, bitten by a black widow that had set up a nest in his shoe. Being a writer, Landers wrote about the experience. In uniquely unenviable detail. The pain of the bite, at first, felt "like a bee sting," Landers says in a video that accompanies his story -- like a thorn that might have gotten wedged in his shoe. He looked down at his foot, and saw "two tiny little pin pricks" -- evidence that he had been bitten rather than stung. This was confirmed by "the squashed remains of a spider" he saw "smeared across the insole." He wasn't concerned, though: Black widow bites are rarely lethal. And the pain, at that point, wasn't unbearable, so he proceeded with the plans that had led him to don shoes in the first place: going fishing at a hole near his house. Landers caught three catfish. But at that point, "the symptoms were progressing." Specifically, he notes, "I felt a warmth in my abdomen." (At first, he says, that warmth "was sort of a tickle. And then it got warmer and warmer.") The tickly heat "turned into pressure, which became a painful cramping." The venom was spreading. "By now," Landers recalls, "the pain had crept into my lower chest, sending out waves of muscle spasms." He realized he would have to go to the hospital. By the time he checked into the ER, Landers had to be transported in a wheelchair. The spasms "gripped my rib cage like a vise." And his symptoms were getting progressively worse. "My biceps cramped. I shivered and twitched uncontrollably." He was moved to a bed. He was "in agony." More specifically (and more poetically): "Waves of pain lapped from my abdomen into my chest as the venom worked its way toward my heart." Six hours after he was bitten, Landers ended up receiving Analatro, an experimental anti-venom that, in his case, ended the pain almost immediately. Had he not received the treatment, though, Landers would likely have experienced something like Brad Porteus did. Answering the "what does it feel like to be bitten by a black widow?" question on Quora, Porteus recounted a series of longer-term sensations that included word-slurring, hallucination, and uncontrollable sweating. And that was in addition to the agony you'd expect. 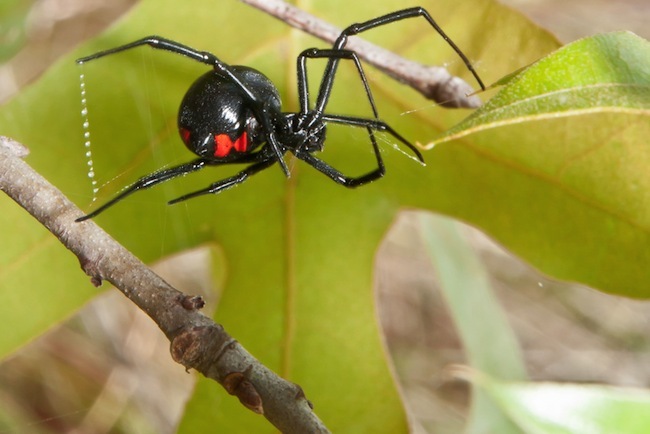 As fellow Quora-er James Carroll, recalling the bites his brother received when a black widow -- eeeeesh -- got caught inside his swim trunks, summed it up: "He said it was the worst pain of his life."